Today, we’re participating in another Partners in Crime Blog Tour and want to say Thank You to them for including us in another great book tour! Keep reading for an excerpt from the book as well as instructions to enter our The Joshua Stone E-book Giveaway! In 1959, in an underground laboratory in a remote region of West Virginia, a secret government experiment went terribly awry. Half a dozen scientists mysteriously disappeared, and all subsequent efforts to rescue them failed. In desperation, President Eisenhower ordered the lab sealed shut and all records of its existence destroyed. Now, fifty-four years later, something from the lab has emerged. When mysterious events begin occurring along the New River Valley in West Virginia, government agents Mike Califano and Ana Thorne are sent to investigate. What they discover will shake the foundations of science and religion and put both agents in the crosshairs of a deadly, worldwide conspiracy. A powerful and mysterious force has been unleashed, and it’s about to fall into the wrong hands. To prevent a global catastrophe, Califano and Thorne must work together to solve a biblical mystery that has confounded scholars for centuries. And they must do so quickly, before time runs out… forever. Malachi slowly shook his head. This was all wrong. To begin with, why was it light outside? He struggled once again to piece together the chain of events that had lead him to this abandoned coal station along the New River Railroad Line. He’d entered the lab around 10:30 P.M., although it might have been a little later. Time– he lingered on that thought for a moment. Something about the time. A new memory was now hovering just beyond his mental grasp, tantalizingly close yet still too vague to visualize. Slowly, bits and pieces came into focus. The Joshua Stone is a cleverly crafted spy thriller interwoven with the Bible story of Joshua and the very sci-fi theory of time-dilation. In other words, an additive page-turner from start to finish. The action moves fast and, if you’re paying attention, James Barney leaves plenty of clues for you to follow. But don’t worry, he has enough twists in this story that you will be surprised at how it all comes together in the end. I found myself making good use of Google so I could find more information about what I was reading. I learned a lot while reading The Joshua Stone and that’s always a good thing. I was pleasantly surprised to discover Barney included a section at the end of book “Separating Fact From Fiction” where he discusses what’s factually true in the book and what was his fabulous fiction created from those grains of truth. 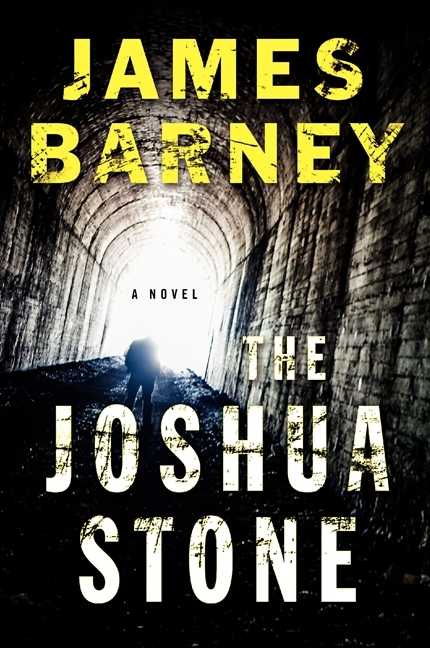 The Joshua Stone is a stand-alone thriller, but the author left the door open for a sequel. I hope he walks through that door and we see Mike Califano and Ana Thorne teamed up together in future adventures! Want to win your very own copy of THE JOSHUA STONE by James Barney? The easiest way to enter for your chance to win is by leaving a comment at the bottom of this post OR you can send us an email to read(at)lazydaybooks(dot)com. When emailing us, make sure you include your name, age (must be 18 or older), city and state where you live. Since we will use email to notify the winner, all entries must include a valid email address. We are giving away an e-book copy of the book, so the winner will also be asked to provide their preferred e-book format so the publisher knows what to send you. The winner will be determined by random drawing on Monday, November 11, 2013 at 8p CST. That gives you five full days to enter yourself and tell all your friends, too! Update 11/12/2013: Congratulations Eric W., winner of our The Joshua Stone Giveaway! Please check your email for instructions to claim your eBook. Thank you to all our participants, please check back often for more great giveaways! IT was time. Dr. Franz Holzberg stood at the security desk of the Thurmond National Laboratory and waited patiently for the guard to buzz him through the heavy steel door that provided access to the lab. Funny, he thought as he waited. They don’t even know what they’re guarding. He shook his head and considered that thought for a moment. If they only knew . . .
A second later, the door opened with a loud buzz, and Holzberg stepped into a steel enclosure about five feet square and seven feet tall. He turned to face the guard and pulled a chain-link safety gate across the opening. Holzberg nodded, and the compartment in which he stood suddenly lurched downward and began its long descent toward the laboratory spaces, nine hundred feet below the ground. Two minutes later, the elevator shuddered to a halt, and Dr. Holzberg exited into a wide, empty passageway, about twenty feet across and two hundred feet long. The cracked, concrete floor was sparsely illuminated by overhead industrial lighting. A pair of rusty trolley rails ran down the middle of the corridor—a remnant of the mining operations that had once taken place there decades earlier. Holzberg took a deep breath and savored the pungent smell of sulfur and stagnant water. After three long years of working on this project, he actually felt more at home underground than in the charmless cinder-block rambler that the government had provided for him “up top,” in Thurmond. He started off toward the laboratory at the end of the corridor, his footsteps echoing loudly throughout the vast space. As he walked, the protocol for Experiment TNL-213 streamed through his mind for the thousandth time. Today is the day, he reminded himself, allowing just the faintest of smiles. Today, God would heed his command. Just as God heeded Joshua’s command at Gibeon. Holzberg passed through the laboratory’s heavy security door and entered a long, rectangular room resembling a tunnel, with unpainted cement walls, ceiling, and floor. The middle of the room was dominated by a large pool of water, twenty by thirty feet across and thirty feet deep, with a steel catwalk extending across it. A sturdy steel railing circumscribed the edge of the pool. Overhead, four long rows of incandescent bulbs illuminated the entire room with bright, white light. High up on the walls, thick, multicolored bundles of wires and cables snaked like garlands across sturdy brackets, with smaller bundles dropping down at uneven intervals to various lab equipment and workstations around the room. Dr. Irwin Michelson swiveled on his stool. He was a wiry man in his midthirties, with disheveled black hair and a two-day- old beard. He pushed his glasses up on his nose. Holzberg nodded appreciatively to his tireless assistant. It took nearly three hours for Holzberg, Michelson, and their team of four technicians to complete the exhaustive checklist for TNL-213. This experiment had taken three years to plan and had required millions of dollars in upgrades and modifications to the lab. Nothing would be left to chance today. By early afternoon they’d finished their thorough inspection of the equipment. They’d checked, double-checked, and triple-checked each of the hundreds of valves, levers, and switches associated with the lab’s “swimming pool” test rig. Everything was positioned according to a detailed test protocol that Dr. Holzberg carried in a thick binder prominently marked top secret—winter solstice. Michelson knelt on the steel catwalk that bridged the 160,000-gallon pool of water and carefully inspected a rectangular steel chamber that was suspended above the water by four thick cables. Numerous electrical sensors were welded to the exterior of this chamber, and a rainbow of waterproof wires radiated out from it, coiling upward toward a thick, retractable wiring harness above the catwalk. “Transducers are secure,” Michelson said over his shoulder. Michelson stood and turned slowly to face his mentor. “No,” said Holzberg firmly, his expression suddenly turning dark. “Einstein was overrated,” Michelson mumbled. Michelson nodded sheepishly. Holzberg patted his younger colleague’s shoulder. The two men made their way to the far end of the room, where a circular vault was mounted flush with the cement wall. The vault door was protected by a bank-grade, dual-combination lock with twin tumblers. “Ready?” Holzberg asked. One after the other, the two men turned the pair of dials on the vault door four times each, alternating clockwise and counterclockwise. When the last of the eight numbers had been entered, Michelson pulled down hard on the heavy handle in the center of the door, and the vault opened with a metallic ka-chunk. He swung the door open slowly, and, as he did, the vault’s lights flickered, illuminating the interior with an ethereal blue light. Thirty minutes later, with the seed securely mounted in its special test chamber, and the chamber lowered deep into the pool, the two scientists returned to the control room for their final preparations. “Transducer twenty-one?” said Holzberg, reading aloud from the test protocol. Michelson repeated the procedure for transducer 22. In the lab space below, the four technicians quickly took up positions at their various workstations. One after another, they gave the thumbs-up signal that they were ready. “Energize the steady-field magnet,” announced Holzberg. A loud, steady hum suddenly filled the lab, followed by the sound of rotating equipment slowly whirring to life. Several seconds later, Michelson quietly reported over his shoulder that the steady-field magnet was energized and warming up. Michelson nodded. “We’re at thirteen teslas and rising,” he said, his attention focused on a circular dial on the control panel. Eight minutes later, Michelson announced they were at 25 teslas, the peak field for the steady-field magnet. “Outlet temperature’s creeping up slightly,” he added with a hint of caution. There was a flurry of activity in the lab space below as the technicians quickly went about opening valves, flipping switches, and starting various pumps and other equipment. Eventually, all four gave the thumbs-up signal. Michelson pulled down on an electrical breaker until it clicked loudly into place. A deep buzzing sound immediately permeated the entire laboratory. The overhead lights dimmed momentarily and then slowly returned to their original intensity. “Energized,” he reported nervously. “Total field is twenty-seven point three teslas.” Michelson was slowly turning a large knob in the center of the control panel. Michelson nodded and again twisted the dial clockwise. He read out the magnetic-field strengths as he went. “We need a higher field.” Holzberg touched Michelson’s shoulder and nodded emphatically for him to continue. Suddenly, there was a loud beep, and an amber light began flashing on the control panel. Michelson started to protest, but Holzberg cut him off. Another shrill alarm sounded on the panel. “Core temperature alarm!” Michelson shouted above the noise. “We’ve got to shut it down!” He began turning the knob counterclockwise. “Bring it up just a bit more,” said Holzberg over the constant noise of the two alarms. Michelson swallowed hard and slowly tweaked the knob clockwise to increase the power to the pulse magnet. Michelson quickly began twisting the knob counterclockwise. After several seconds, however, he suddenly looked confused. Holzberg leaned in close and observed that the dial for delta T was now spinning rapidly clockwise. An odometer-style counter below the dial indicated that the accumulated value was now at 500 seconds . . . 600 seconds . . . 700 seconds.. . . The dial was spinning faster and faster. “Shut it down!” Holzberg bellowed. “I am. Look!” Michelson showed that he had already twisted the knob for the pulse magnet all the way to the left. At that moment, a thunderous scream erupted in the lab space below, and thick plumes of steam instantly billowed up from the pool. The technicians could be heard screaming emphatically to each other. “Relief valves are lifting!” Michelson yelled over the cacophony. Holzberg was just about to say something when suddenly there was a blinding flash of white light below. Instinctively, he shielded his eyes. Holzberg uncovered his eyes and gazed in awe at the spectacle now occurring in the lab below him. A brilliant aura of light was hovering directly above the reactor pool, swirling in undulating patterns of blue, green, red, and yellow. The aura lasted for several seconds before giving way to a violent, blinding column of light that shot suddenly out of the pool, straight to the ceiling. Holzberg again shielded his eyes. A split second later, there was a loud whoosh and the entire lab filled with blinding white light. The control room windows shattered instantly, and Dr. Holzberg hit the floor. The blinding light and whooshing sound subsided after several seconds, leaving in their place a terrifying jumble of alarm sirens and horns and the panicked shouts of the technicians below. Holzberg groped on hands and knees through the broken glass until he found the prone body of Dr. Michelson, who was either unconscious or dead. With effort, Holzberg pulled himself to his feet and gazed in utter disbelief at the chaos unfolding below him. A second later, a man in a black leather coat suddenly appeared in the lab space below, seemingly from nowhere. Who is that? Holzberg wondered, utterly confused. And why does he look familiar? You can learn more about author James Barney by visiting his website. Thanks so much for featuring this title on your site. Great review! I always appreciate author notes, too; good to hear there’s a “Separating Fact From Fiction” section. And a chance to win a copy. Nice! This book sounds really interesting, I’d love to win a copy! Sounds like a great story! The story line and the inclusion of the author’s notes and “separating fact from fiction” reminds me of James Rollins. Yes! If you like James Rollins, you’ll enjoy James Barney as well. Please enter me in this contest. I think this would be great to read while I’m traveling over the holidays.